This Shadow Box represents my life and how I love the things I have or what was already assigned. The objects that are in my box also are what I love to have and love to play such as soccer or Mexican objects that represent me as a person. The soccer field that I have in my Shadow Box is of how much I love the soccer field and love to play on it. One of my chosen identities is to be a soccer player. Also, both of the pictures that are in my Shadow Box are of how I was before as a little person. A person can hardly see that I am Mexican because I am light skinned, but I am still Mexican but was born here in the United States. My race is Latino, my ethnicity is Mexican, and my nationality is American. But I’m Mexican because my dad was born in Mexico. A lot of the things that are in my Shadow Box are based on Mexican objects such as the money, the flags, and the candy. The two necklaces that are in my box are from a very beautiful place in Mexico called, Puerto Vallarta. It’s very cool and good looking there because the beach is so beautiful and the sand is so hot and the water is warm. I got the necklaces from a shark tooth figure in this one cool store and the shark tooth figure on the necklace is made from stone and the other necklace is from crystal. Then the shinguard in the box is how much I play soccer and how much I love to play soccer. My Representative Shadow Box by Alex is licensed under a Creative Commons Attribution-ShareAlike 4.0 International License. I like how you explained each of your objects, I also liked it a lot because I think you put objects with which you identify, I think you did a good job with your shadow box because in truth you look that you identify where you are and who you are. thank you for share your piece. I like how you added very specific things to describe the different identities. I like how on of your chosen identity is being a soccer player because I like playing soccer as well we have something in common. I love how you made a soccer field in your shadow box. That shows how you are so creative seeing this soccer field on your shadow box inspired me to make a soccer field in my shadow box, So thanks for sharing this shadow box with us. Keep on doing what you are doing. It’s coming home. I really like your poem! You did a very good job on your shadow box. I really like how you explain every little detail that you show in shadow box. Thank you for sharing your work. My name is Tania and I am a student at Fremont High School. Something I liked about your work was that you represented where you are from. Something I have a question about is what part of mexico you’re from. Please feel free to comment on my work in the future. The address of my student blog is http://taniarfhs2021.edubolgs.org/ . I like how in your shadow box you have about soccer and that you are mexican. Then the shinguard in the box is how much I play soccer and how much I love to play soccer. Is good to have that because you can protect yourself from getting hurt or injured. And I connect to this because I also like to play soccer and am mexican and go for Real Madrid. wssp my name is pedro and am writhing from fremont high school and am also from mexico what part of mexico are u from?? Thanks Pedro, The part of Mexico I am from is Jalisco. Pretty cool! 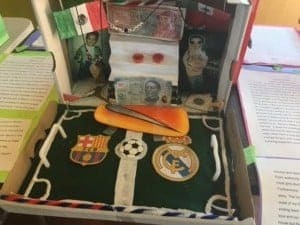 Alejandro, I really liked your shadow box and how well you incorporated soccer and objects that are a representation of your heritage. I further ask you, do you play on a competitive team? Also, do you think you play soccer on a higher team in high school? Also, what about do you like especially? Playing soccer also have many good benefits such as “Soccer is a good sport for maintaining health, fitness, strength and endurance. I really enjoy the way you explained why everything you included in your shadow box is importnt to you. I am a senior at Fremont High School and I am looking forward to seeing your next posts and seeing you play for Life academy this soccer season. Here are a few questions to help you think furtherly. Why is soccer so important to you? What is your favorite soccer team and why? How does soccer shape the way you are? I really enjoyed the phrase , “The two necklaces that are in my box are from a very beautiful place in Mexico called, Puerto Vallarta. It’s very cool and good looking there because the beach is so beautiful and the sand is so hot and the water is warm” , because it helps me imagine Puerto Vallarta which shows your writting is engaging. I think that it is really cool what you put in your box. I am really intrigued with the things you put in the box. I think this is a cool project to show who you are and what you believe in. I found your background to be very interesting and shadow box to be very interesting. I thought your creation of the soccer field was very creative and looked really good. I also enjoyed reading about the different things from Mexico that you put in your box. I really enjoyed reading your piece. I found your use of descriptors enhanced my understanding of your shadow box very well. It made it very easy to understand you as a person and a little bit of your background too where you talk about how your “race is Latino, my ethnicity is Mexican, and my nationality is American.” I found it a little distracting when you talked about Puerto Vallarta but the overall syntax of the piece was wonderful. Thanks for sharing your piece.